Exciting times at the Writers’ Unleashed Festival, a one-day writers’ fest in Sydney’s ‘The Shire’ – not only did I get to experience a day immersed in the world of books (and book lovers), but placed in a picture book comp! Somehow, twice! 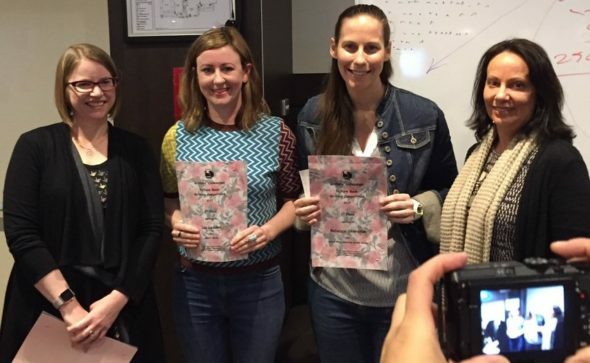 The competition results were announced by the judges of the shortlist, Zoe Walton of Penguin Random House and Sue Whiting (ex-Walker Books, author and editor). The lovely Rebecca Sheraton was the winner, and two of my manuscripts placed second and third. A member of one of my writers’ groups, Colleen, was shortlisted too, adding an extra level of yay. 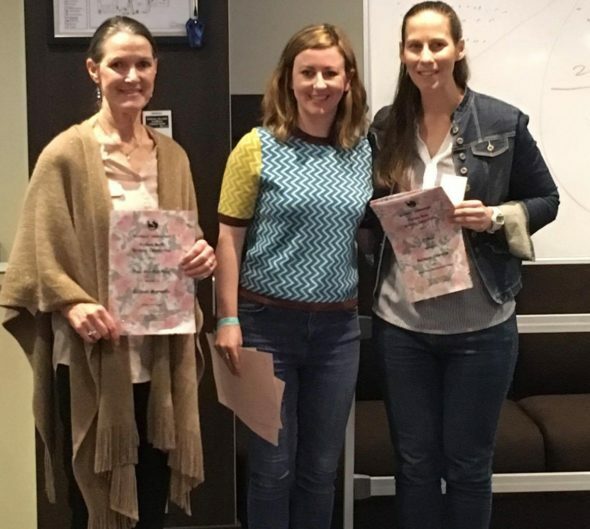 It was an exciting (if knee-shaky) moment accepting our awards in front of the whole conference, especially when there was a paparazzi-like swarm taking our pics afterwards (mostly writers’ group friends, but still, SCARY!). It’s funny, some people have asked me, ‘So, what was the prize?’ as though prompting for details about piles of sweet, sweet cash and a gazillion-dollar publishing deal, but the real prize (for me, anyway) is encouragement to keep going. Aside from the comp announcement, there were some great sessions like Sandy Fussell‘s talk on all things tech and social media for writers (she’s a fan of apps like Trello, Feedly and buffer to schedule posts). YA author Sarah Ayoub spoke about creating relatable female characters, with a focus on identity and diversity. She made an excellent point about not taking away someone else’s chance to tell their story, but instead, weaving in diverse secondary characters. And there was a fantastic picture book masterclass held by Sue Whiting. Some of her key tips include recording yourself reading your manuscript aloud to discover the clunky bits, figuring out what your story is about at its core so every word can drive the story, and to be specific about details to develop your characters and make your story stand out (she used Gus Gordon’s Herman and Rosie as an example, where even a yoghurt flavour is mentioned). Children’s author and everyone’s favourite podcast host Allison Tait was there too, talking strategies on making time to write (which I sadly missed). By all accounts it was excellent. Overall, an inspiring (and encouraging!) day.